Careers planner for 16–18s (KS5) - Which? Sixth form is full of big and exciting future decisions for Year 12 and 13 students. 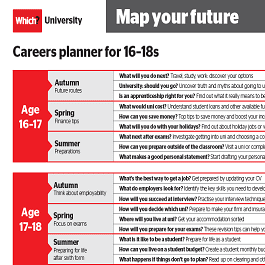 Use our free careers planner to help set them on a path to a bigger, brighter future. Now's the time for students to map their future – and as their teacher it's your job to guide them on their journey. Our downloadable careers planner for 16-18s is the ideal tool to use – full of practical ideas and inspiring activities for you to work through together. Download and print the free planner, below. It's a double-sided poster, with one side aimed at students and the other for teachers. The posters have been designed to print out at up to A3 size, but will also resize to smaller paper sizes. What's included in the careers planner? • A term-by-term breakdown for each age group, highlighting key issues and questions to consider at each stage. • Important dates in a quick at-a-glance chart – from key Ucas application dates to results days and Clearing. • Designed to use as a wall poster, enabling students to keep a visual track of what they need to think about. How will you decide which uni? Read through our article about making first and insurance choices and encourage students to think about how they will make their own decisions. How can you live on a student budget? Ask students to come up with ideas for how to make their student loan go further. Use our resources to give extra suggestions. What is it like to be a student? Ask students to make a list of things they are excited about, nervous about or unsure about. Then use our links to encourage some independent research: How can they best prepare themselves? Download our free KS3 careers planner - this simple step-by-step guide is packed with ideas and inspiration to help prepare 11-14 year-olds for their future. Help KS4 students lay the foundations for their future by downloading our free careers planner for a range of practical activities for 14-16 year-olds.